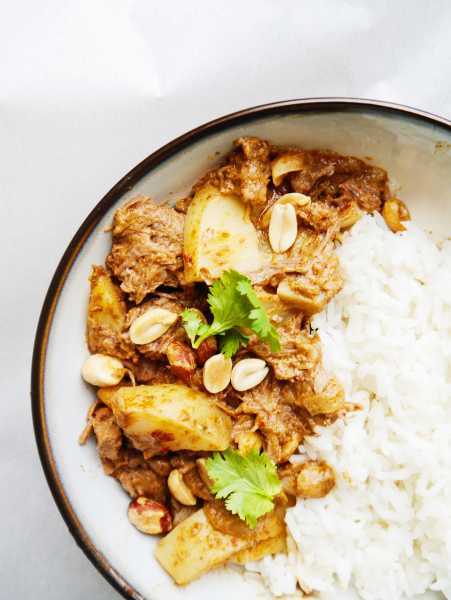 I love Thai massaman curry, and so do my kids since it’s not spicy, and the meat is so tender that it’s easy for them to eat. But what’s even more amazing is using a crockpot to make it since with Thai food, I hardly ever have the opportunity. Many Thai dishes are stir-fried quickly a few minutes before it’s time to sit down and eat, and taste best eaten immediately. That’s why whenever we have people over for dinner, it’s usually a stressful few minutes before they walk in the door since I don’t like to cook while hosting. Want to hear an awkward hosting moment? We had invited friends over for dinner. I was in the middle of stir-frying pad thai, and had timed it all perfectly that once I finished making it I would run around and pick up the last of the toys my toddlers had strewn about while I was cooking, and then our guests should be here, and dinner would be on the table and ready to eat. Way to make my guests feel at home! So I’ve chilled out since then, and have learned/am still learning that it’s ok if I have to do some cooking while my guests are here, and if my house isn’t perfectly picked up. What’s most important is creating a safe, welcoming, loving atmosphere for my guests, which starts with me, their host, being at peace the moment they walk in the door. 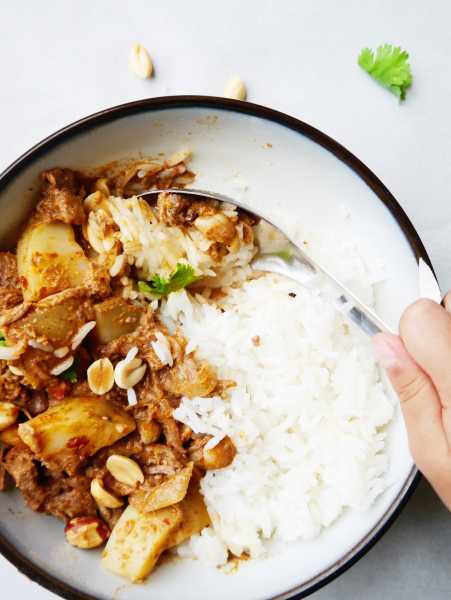 One way I can do that is through my Thai Crockpot curry recipes! The crockpot does the work for me, so I can be focused on loving and encouraging my guests. 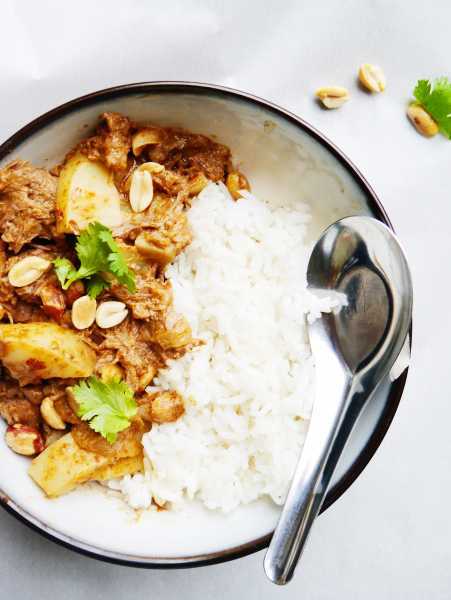 So invite a neighbor over for some Thai massaman crockpot curry today, love on them, and enjoy the crockpot working hard for you! 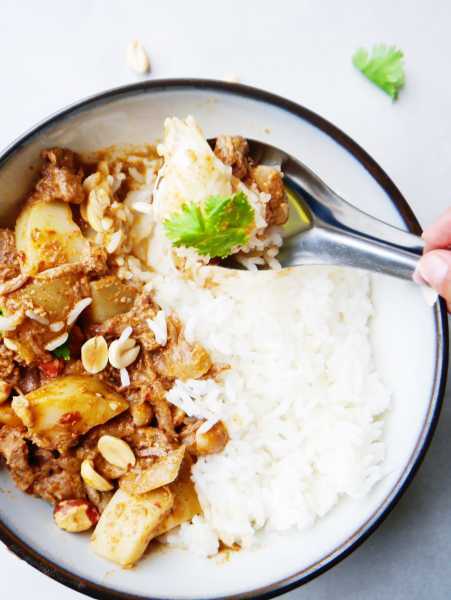 All the cozy flavors of Thai Massaman curry, but with the ease of the crockpot! Thai curry paste, beef, onion and potatoes, the best way to warm up a cold night! Mix together the curry paste and coconut milk in your crockpot. Add the beef, potatoes and onion. I like to cook it low and slow for 8 hours, but of course cooking it on high for 4-6 hours works fine too. Once it's done, sprinkle peanuts over it, add fish sauce and sugar to taste. Serve with jasmine rice and your favorite veggie side dish! You can use other meat, such as chicken or pork, but if using chicken I recommend thighs which stay more moist if cooked for a long time. And don’t forget to pin it up for next time!